Heather, over at Rocky Mountain Cooking, recently posted her recipe for Carne Advovada and it sounded too good to pass up, especially since I’d found adaptable ingredients while freezer diving - check out her site for the recipe she used. According to Wikipedia “Adobada is generally pork marinated in a "red" chilli sauce with vinegar and oregano, …” and after looking at several recipes on-line this seemed to be accurate, but since Heather’s use of green chile sauce is the part that appealed to me, I decided to stick with hers. Due to our travel plans, we didn't really have a garden this year but we did plant a few tomatoes and peppers to eat on. As usual, we have a large fall pepper crop and while we’ll freeze a few, we are planning dishes around eating them fresh - like in the old days when folks ate whatever was ready in the garden. For this meal, we decided on a recipe from Allrecipes for Chicken and Peppers with Balsamic Vinegar. Saturday Humor - Three Contractors Bid On The White House Fence. This would be hilarious if it wasn't so likely to be reality. One is from Chicago, another is from Kentucky, and the third is from New Orleans. The official, incredulous, says, "You didn't even measure like the other guys. How did you come up with such a high figure? And that, my friends, is how the Government works. Now that Madison is back in school, we are pretty tied to her schedule and for her fall break we made a short trip to WV where we visited with my relatives in Fairmont and she stayed with her mom’s family in Wheeling. In addition to visiting, we did the normal Fairmont things that included some hot dogs from Woody’s and pepperoni rolls from Colasessano’s and we checked out the Stonewall Jackson State Park campground for its ability to accommodate our RV. It’s not often my cousin gets to mow his grass shirtless in mid-October. Say what, you asked? If you know me or have read my blog for very long, you likely know I am somewhat of a BBQ purist and subscribe to this definition – BBQ is meat cooked slowly over low heat (preferably indirect) in a smoky environment. I know that this is the minority opinion in America so nuf about that. I used this title because it will probably be the only time I use the words barbecue and Crockpot in the same sentence and I just had to do it to see how it felt. 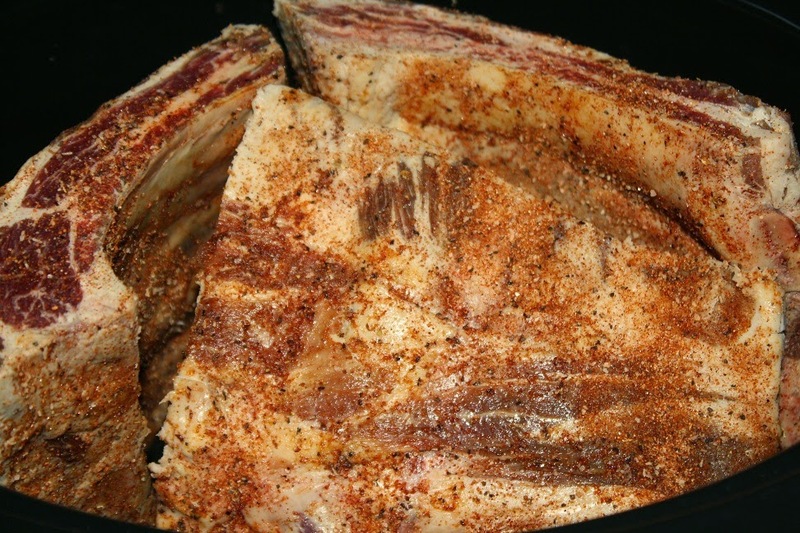 In my continuing and seeming lifelong effort to clean out our freezers, I discovered a rack of beef ribs that had been there for a couple of years and were not vacuum sealed so I suspected they might be in bad shape or at least old tasting. After thawing, removing the foil and plastic wrapping, and rinsing they looked and smelled fine and with no freezer burn. Bev had bought some salmon just to have with dill sauce and I went about a web search to find a recipe and ended up with one from Taste Of Home for both the salmon and the sauce. The recipe is for baked fish but I did it on the grill - given a choice, I always choose the grill as my grilling season is 12 months a year. This is the recipe for the dill sauce and we made it the day before to allow the flavors to marry well. Combine the sauce ingredients until smooth. 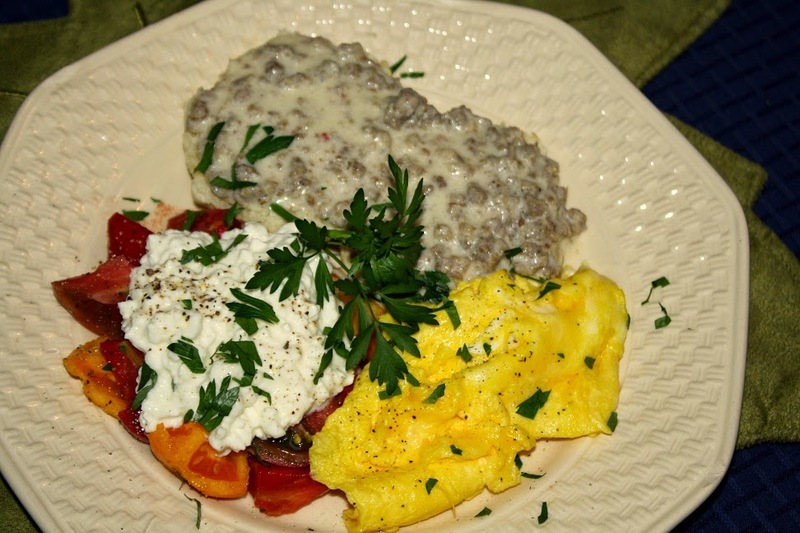 Perhaps the best part of our Wine Club party food was a bunch of the practice biscuits still in the freezer and gravy left over from the party to which we added a couple of scrambled eggs, and picked-that-morning tomatoes with cottage cheese. I'm pretty sure tomato and cottage cheese did not originate locally, but it still seemed like a delicious southern breakfast to me. Labels: Breakfast, Humor, Leftovers, Misc. In my last post, I discussed the September meeting of our wine club with the theme of “Food and Wine from East Tennessee” where each couple brought a bottle of wine from our area for the tasting and a small plate dish from this area or the southern mountains. Our selections were wild boar sausage gravy with buttermilk biscuits and a peach wine from Chestnut Hill Winery in Crossville. 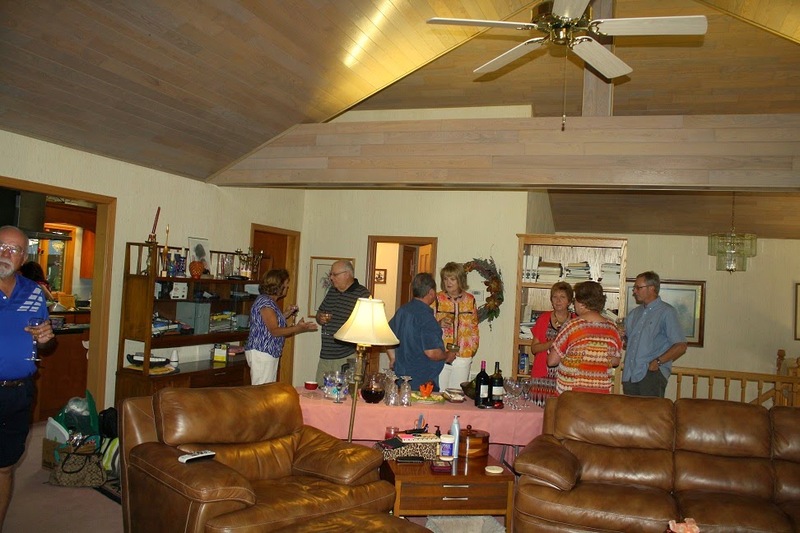 We hosted the September meeting of our wine club and selected a theme of “Food and Wine From East Tennessee” so each couple was asked to bring a bottle of wine from our area for tasting and a small plate dish from this area or the southern mountains. The photos are courtesy of Big Daddy Dave and should give you a sense of the evening. We began with appetizers of pickled watermelon rinds, pickled beets, and Bev's pimento cheese stuffed celery washed down with some wine and margaritas. 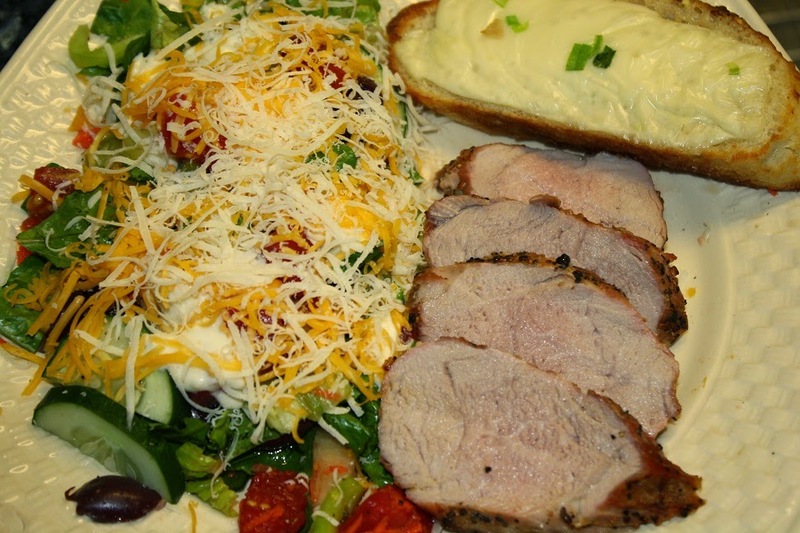 Since this was such a simple meal of grilled pork tenderloin, salad, and garlic cheese toast, I had not intended to post it, but since both the meat and Bev’s salad looked so good, I couldn’t resist. I pulled the meat from the grill at an internal temp of 138* in the thickest part, tented, and let it rest about 10 minutes. It was very juicy and just a little pink – just the way I like it – and the small end went to those who prefer theirs more done.